Judy Blumberg was an American ice dancer. With her partner Michael Seibert, she won the U.S. Figure Skating Championships 5 years in a row and was expected to win Olympic Gold but finished 4th. What should we expect from her birth chart ? If we think of her as the Ice Queen and look for symbols associated with that image we should be on the right track. The signs that are most associated with the cold are Capricorn and Aquarius but also Virgo with its emotional coolness. 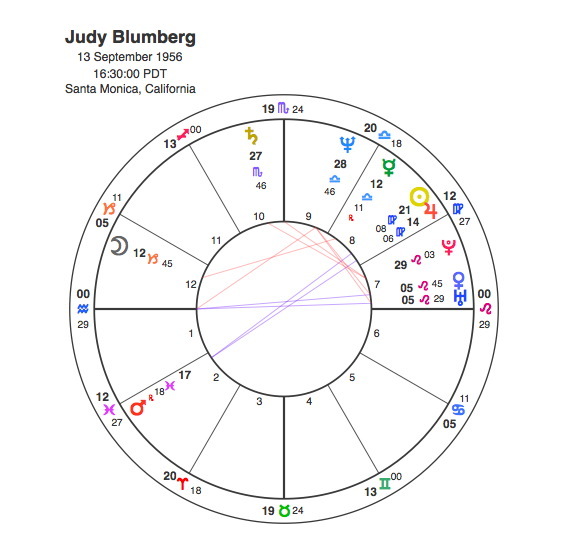 Judy Blumberg has the Sun in Virgo, Moon in Capricorn and Aquarius rising. Its a combination that suggest someone who worked extremely hard and was driven by a perfectionist streak. The Sun is conjunct Jupiter showing that she would be very successful and this combination is opposite Mars which indicates a strongly competitive nature and the likelihood that sport would be her chosen career. Mars’ sign indicates what type of sport and Pisces would be appropriate as figure skating is based on artistic merit and sensitivity. Ice dance is fundamentally about balance and working with a partner so closely that the two individuals become one, so Libra or the 7th house should come into it. Blumberg has 3 planets in the 7th house including an exact Venus / Uranus conjunction. Venus rules artistry but also the capacity to operate harmoniously in partnership, the conjunction with Uranus suggests an unusual relationship that inspires her to reach higher levels of performance. Blumberg’s ice dance partner was Michael Seibert. The most important thing with ice skate pairs is synchronisation so we would expect a lot of close connections between their charts. 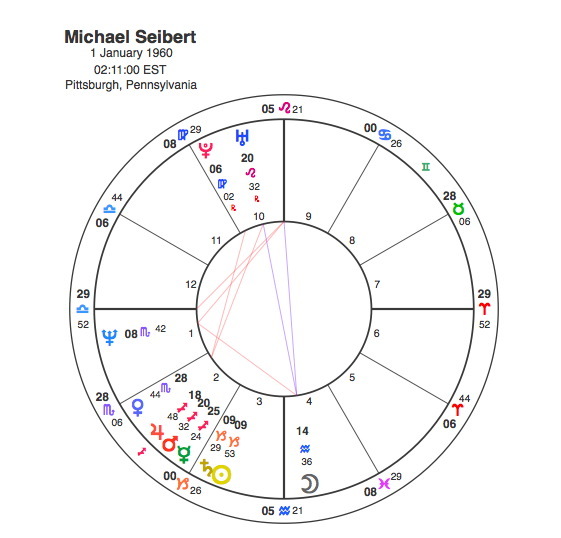 The first thing to note is that Michael Seibert has the Sun in Capricorn closely conjunct Judy Blumberg’s Moon. The Sun of one chart in aspect, particularly conjunction with the Moon of another is the classic astrological relationship contact. It means that the the being ( Sun ) of Michael is completely attuned to and in harmony with the instincts ( Moon ) of the Judy. Michael has the Moon in Aquarius, Judy’s rising sign so his instincts accord with the way she naturally expresses herself. Even more intriguing than that is the fact that his Moon and her Ascendant are both in Aquarius opposite Uranus and they both create a T Square with Neptune. This takes the understanding between them to a spiritual even telepathic level. Neptune is not a natural fit for sport but it is for dance. It’s role is to encourage release and the letting go of the small individual sense of the self becoming one with something greater. It’s clear that Judy and Michael reached this level in their work together. Michael Seibert does not have a 7th house partnership strength but he does have the 7th sign, Libra rising. Michael and Judy’s Ascendants are in close square aspect to each other. Also Judy has a Mars / Jupiter opposition, Michael has the two planets in conjunction. Michael’s Mars / Jupiter creates a T Square with the opposition in Judy’s chart. All these aspects create an exceptionally profound connection between the two. This connection was strongly stimulated by the transits to their charts. A major watershed for Judy was in 1967 when she first fell in love with skating at the age of 11, as Pluto was conjunct her Sun. Their career peaked in 1983 – 5 with the Olympics in 1984. In 1985 they won their 3rd consecutive World bronze medals. In 1986 they turned professional. Pluto was conjunct Michael’s Ascendant in 1984 and was transiting Judy’s T Square conjunct Neptune and square to her Ascendant and Venus / Uranus from 1983 – 86. Pluto made the same transit to Michael’s Moon / Uranus / Neptune T square from 1987 -89. This marked another peak as they were World Professional Champions in 1988. But the most significant turning point of all was when Judy and Michael met in 1977. Pluto was square Judy’s Moon and Michael’s Sun at the time ensuring that the Ice Queen found her King.